Loved this recipe! It turned out to have more of a muffin/cake consistency versus an ooey gooey cookie, but regardless this recipe was quite good! Preheat oven to 375 degrees F. In a medium bowl, whisk together flour, salt and baking soda; set aside. In the bowl of an electric mixer beat coconut oil, brown sugar, vanilla, and egg until well combined, smooth and creamy. Keep mixer on low speed and add in mashed banana. Next add in all dry ingredients (except oats and chocolate chips); mixing until just combined. 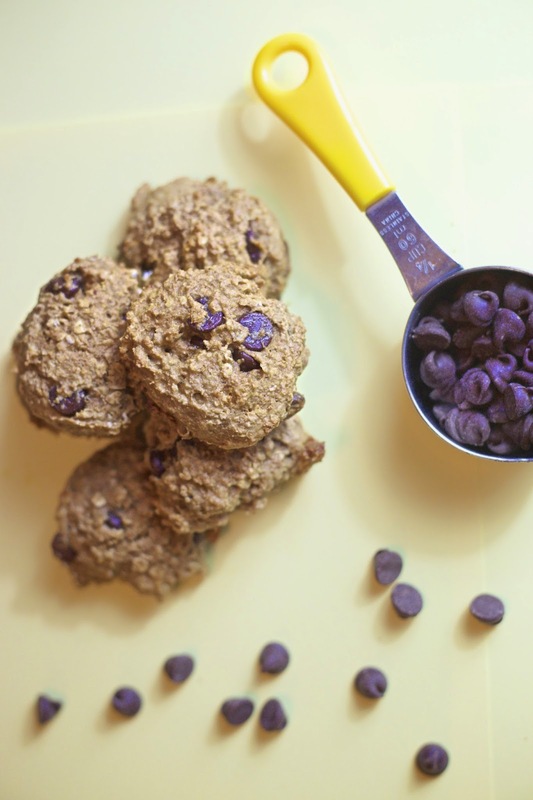 Gently fold in bowl oats and chocolate chips with a wooden spoon. Using a cookie scoop, drop dough onto prepared baking sheet. Bake cookies for 10-13 minutes or until edges become golden brown. If your cookies are too thick for your liking, you can gently smoosh the dough down with the palm of your hand before baking. Makes about 20 cookies. Cookies should be stored in a covered container and will get softer and more cake-like the following day after you bake them.